“Our first championship – and our first win,” exclaimed the exuberant Botswana number one Alister Walker as he stepped off the court after winning the decider against Poland on the second day of qualifying in the WSF Men’s World Team Squash Championship in France. Both Poland and Botswana are making their debuts in the 24th edition of the biennial event which is being held in France for the first time. Action is taking place two venues in Mulhouse – the Espace Squash 3000 Centre and the Palais Des Sports where, for the first time, play is taking place simultaneously on three ASB all-glass showcourts spectacularly lined up side-by-side. Lekgotla Mosope put Botswana ahead with an 11-1, 11-4, 12-10 victory over Marcin Karwowski, but Pole Lukasz Stachowski fought back, beating Koketso Ntshebe in four games to level proceedings. It then took just 22 minutes for Walker, the US-based world No15, to despatch Poland’s top-ranked Wojtek Nowisz 11-7, 11-2, 11-5 to clinch victory. “It will definitely be good for squash in Botswana and will help us get recognition from the relevant bodies,” said Botswana Squash President TK Rabasha afterwards. 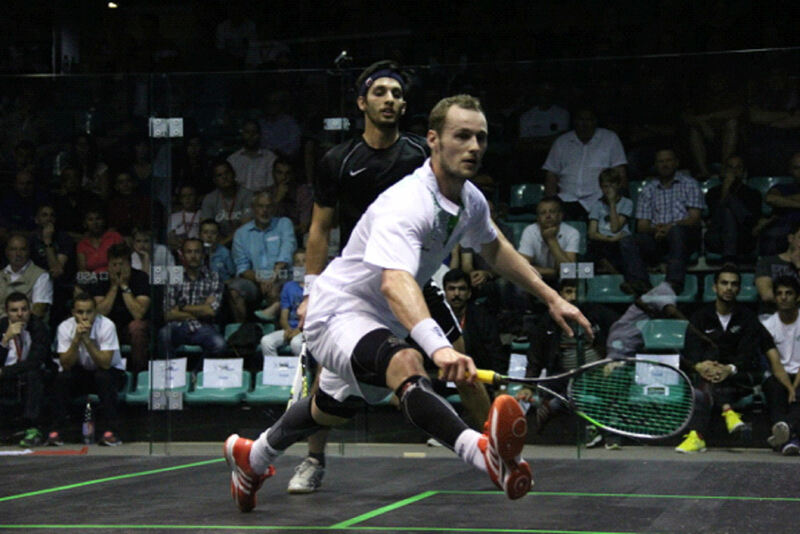 “It will give them an appreciation of what squash can do for the country. And hopefully it will help us attract sponsors. The fourth member of the squad is 14-year-old Theo Pelonomi, surely one of the youngest player ever to compete in the championship! Third seeds France faced Pakistan on the centre court at the end of the day, and forged a 3/0 win over the former champions to extend their leadership of Pool C. Thierry Lincou and Mathieu Castagnet earned straight games wins over Farhan Zaman and Farhan Mehboob, respectively, world No2 Gregory Gaultier beat Nasir Iqbal (both pictured below) 11-8, 11-8, 11-5 to maintain the hosts’ clean sheet. “I’m very pleased overall with the team’s performance – they did the job,” said French national coach Renan Lavigne. “We have a lot of respect for Pakistan, which is why we put out our strongest team – we wanted to play with the top three to show that we were up for a big match. “Thierry gave us a great start and Mathieu put in a good performance – Farhan has great racket skills and is certainly top 20 material. “One thing that really touched me was that the Pakistan players wanted to get their pictures taken with our players,” added the former world No17. “Yet years ago, when I was playing, it would have been the other way round. That was quite significant. The top two seeds Egypt and England also posted 3/0 wins. Playing at the Espace Centre, defending champions Egypt beat Scotland, while second seeds England defeated 15th seeds Canada on the centre court in the Palais des Sports. “It’s the first time on the glass court – and the major objective was to win, of course, but also to get a good run out on the court,” explained England national coach Chris Robertson. 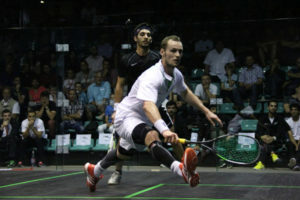 England’s world No3 James Willstrop put the team ahead with a 19-minute 11-6, 11-8, 11-6 defeat of Canadian Dane Sharp. Both he and team-mate Nick Matthew are celebrating their sixth successive appearances in the event. “This year’s event is particularly special for me as I have had a long association with the Mulhouse club in the French league,” said Willstrop. “I know a lot of people here and Thierry Jung has put a lot into this event – he’s a massive squash fan. “This is an exciting event that doesn’t come around that often so it’s good to make the most of it. And the set-up here is almost revolutionary – I’ve never seen anything like it before, with three glass courts side-by-side. Seeded eight and nine, respectively, India and Finland were sure to be giving their all in their Pool H clash. But impressive performances by Ramit Tandon, Mahesh Mangaonkar and Saurav Ghosal saw India record a decisive 3/0 victory. In one of the longest ties of the day, sixth seeds Germany beat USA, the No11 seeds, 2/1. Raphael Kandra put Germany ahead when former US champion Julian Illingworth was forced to concede the match through injury after the third game. A sparkling performance from retired US pro Gilly Lane against Jens Schoor saw the underdogs draw level. But a focussed bid by Simon Rosner saw the German number one beat Christopher Gordon 7-11, 11-6, 11-6, 11-7 to give the sixth seeds their second win of the championship. The only upset of the day took place in Pool G where 25/28 seeds Japan beat Austria, seeded in the 21/24 group, 2/1.